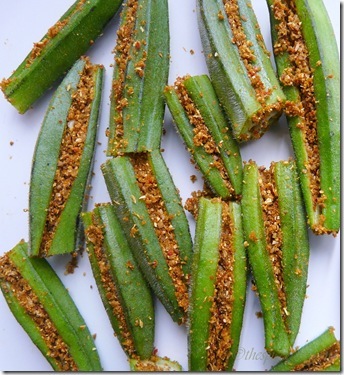 Cut the Ladiesfinger in to four slits without breaking the bhindi. Mix all the above ingredients together to make a filling stuff for Bhindi. Add a small quantity of each mixture of filling in each ladyfinger and fry it in oil till it becomes stiff and the ladiesfinger colour turns almost fried.